A multitude of "do not’s" confronted me my visit to the Petrified Forest National Park and Painted Desert in eastern Arizona, including, "Do not remove any natural or cultural object from the park, including fossils, rocks, animals, plants, artifacts, etc. Do not throw rocks." This is the kind of warning intended to save the area for future generations. The problem is that it is years too late. Despite precautions and warnings, people keep walking off with samples. In the early days, they took petrified trees off by the truckload. When I compare pictures taken today with pictures of years ago, I can see how the Petrified Forest has been thinning out. When my wife Carla and I visited 35 years ago with our four daughters, it was a much richer environment. 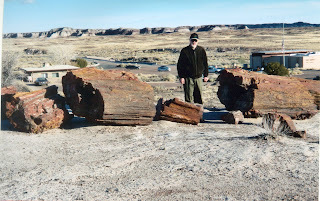 On a more recent trip, as we entered the 28-mile-long road through the Painted Desert and the Petrified Forest, we were asked whether we had any petrified rocks or other artifacts in our car. When we left the park at the other end, the guard simply looked at us and waved us on, but other cars were stopped, and the trunks were being inspected for contraband. At the center for visitors, a 20-minute introductory movie explains how the forest was formed. It’s unbelievably old, the trees growing before the advent of major dinosaurs on earth. Someone with a very active imagination, and probably considerable research, came up with the story of how all this came about. Giant trees were uprooted by massive floods and carried to this spot, where they were covered with sediment that prevented them from decaying. Then there was the slow process of mineral-laden water percolating down. Over eons, silica crystals replaced the cells of the trees. On the first part of the drive there are no petrified trees, but the colorful, untamed landscape has places to stop where you can get spectacular views. The views are so large that you can’t capture their full impact with a camera. Puerco Indian Ruin is the remains of a settlement occupied by Pueblo Indians 600 years ago. 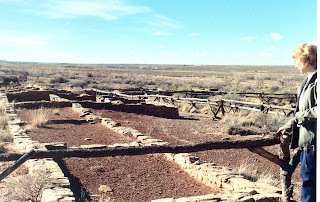 We toured Puerco Pueblo, the remains of a 100-room pueblo that was partly reconstructed. In the usual Kiva, the men could meet to discuss important spiritual questions while the women ground the corn for dinner. At first the Indians in the area lived in scattered settlements, but around 1100 they began building larger pueblos such as Puerco. At that time the Puerco River provided water year around and soil was rich allowing farming. Birds and other game were available. The last occupants appear to have left around 1400. At the lookout points for the Painted Desert, we wondered how anyone, even with a bit more moisture, could ever have lived here. Life would have been very tough, and I suspect people on average died quite young. We took a longer walk into a valley called Blue Mesa on a trail through a badlands that had some petrified trees but was mostly rounded hills that were eroding badly. It was eerie to be walking in a landscape that was so devoid of plants and had trunks of trees some 227 million years of age. At Newspaper Rock there are 650 petroglyphs on boulders below the viewing cliff. 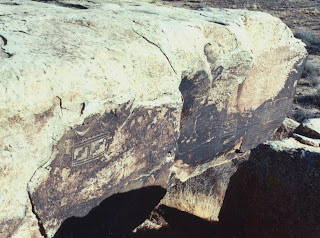 The artists among them produced these patterns and figures by pecking at the dark coating on the rock with tools to remove the desert varnish and expose the lighter rock. Because some visitors had defaced the area, you must view them with a spotting scope that does provide a clear picture of this large variety of American Indian symbols. The final walk we took was at Giant Longs Trail, which has the largest display of trees in the park. We could see that some of the trees had been 6 feet thick and, we were told, 200 feet high. Given how much animal life has changed in 234 million years, I suspect there have been similar changes in trees. Horseback riding, hiking and overnight camping are allowed in parts of the park. Despite the "do nots" and loss of petrified trees for souvenirs, this is a site not to be missed.